Hong Kong Airlines makes its North American debut with the launch of its non-stop daily service between Vancouver, Canada (YVR) and Hong Kong International Airport (HKG) on June 30, 2017. To commemorate the airline’s entry into the gateway city, the airline has partnered with two of Vancouver’s favourite dining destinations to curate a special culinary program in-flight. The flight from Vancouver offers a new menu from Dynasty Seafood Restaurant’s Executive Chef Sam Leung and Dim Sum Head Chef Garley Leung—celebrated chefs at an award-winning restaurant in Vancouver—who formulate the meal for Business Class. Dynasty Seafood Restaurant has been awarded “Restaurant of the Year” by the Chinese Restaurant Awards, as well as Vancouver Magazine in April 2017, making it the first Chinese restaurant to win this top accolade. Business class passengers on YVR-HKG route enjoy the award-winning signature dishes from Dynasty Seafood Restaurant, including a Baked Mince Pork Pie and an in-flight version of the Hand-Shredded Smoked Chicken. 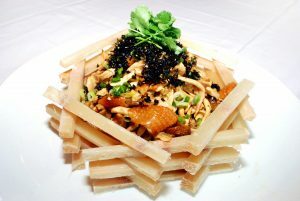 “Vancouver is world-renowned for having some of the best Cantonese food outside of Hong Kong, and Dynasty’s long tradition of combining the freshest of Canadian ingredients with authentic Chinese cooking techniques truly showcases the best of East and West. We are delighted to have them on board as our partner to create a menu that will not only be familiar to our Canadian customers but one that will also provide a great introduction to the rich diversity of Vancouver’s gastronomic offerings to our Hong Kong and worldwide customers,” says Christopher Birt, General Manager of Inflight Services of Hong Kong Airlines. At the Fairmont Pacific Rim’s new restaurant, Botanist, resides David Wolowidnyk—one of Vancouver’s most visible and celebrated mixologists (holding titles including “World’s Most Imaginative Bartender,” “Canada’s Best Mixologist,” and “Bartender of the Year”), and now his award-winning cocktail creations can be found in the skies. The Skybar (one of two on the aircraft) in Business Class serves Wolowidnyk’s signature cocktail called the Bauhinia, referring to the flower depicted in the Hong Kong Airlines logo. Made with Rémy Martin XO cognac, champagne, freshly-pressed grape juice, tea and lemon, the beverage is inspired by Hong Kong’s official flower—a hybrid plant native to Hong Kong. The vibrant magenta tree flowers embody Hong Kong’s history of uniting East and West, and Hong Kong Airlines calls on the flower—and, here, Vancouver’s Botanist—in alliance with the territory’s spirit of fusing old and new, tradition and innovation. 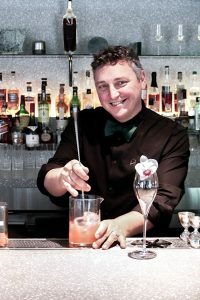 The Bauhinia cocktail makes its debut on the inaugural flight on 30 June where David is personally tending the Skybar for the airline’s business class travellers, including Jackie Chan. The cocktail will be available on all services between Vancouver and Hong Kong shortly after route launch. Economy Class travellers are not forgotten on Hong Kong Airlines, as the airline serves a selection of snacks, including gourmet popcorn by Joe & Seph’s, available during the journey—perfect to create the best sky theatre experience alongside the iPad mini 4 pre-loaded with movies for passengers on the long haul Vancouver flight, delivering a flexible and versatile in-flight entertainment experience. The top premium popcorn manufacturer in the United Kingdom and Europe air-pops its own corn and makes all its snacks in a north London factory, creating bespoke flavours for international markets. The service between Vancouver and Hong Kong on an A330-200 aircraft offers a number of amenities unique to this particular route. Canadians experience the airline’s award-winning service and commitment to serving its loyal international clientele, with particular attention to its newest, growing market of North American travelers via these new, exclusive food and beverage offerings inspired by its first Canadian route. As Hong Kong’s second largest airline serving more than 30 destinations in the Asia Pacific region, Canadians will now have greater access to Asia’s World City and beyond with this new transpacific route. Hong Kong Airlines’ new year-round service will further link Vancouver and Canada with one of the world’s most dynamic cities.